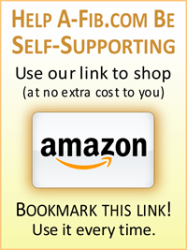 Dr. M (John Mandrola) in his excellent blog described fascinating research using stem cells to regenerate damaged heart tissue. Patients who had suffered a heart attack or who had advanced heart failure and heart muscle damage received infusions of stem cells grown from cells taken from a biopsy of their own heart. Dr. Robert Bolli of the University of Louisville and Dr. Piero Anversa at Brigham and Women’s Hospital/Harvard Medical School took the heart stem cells harvested from patients during coronary artery bypass surgery and sent them to Boston where they were purified and allowed to grow. Once there were about 1 million of the stem cells per patient, Dr. Bolli’s team in Louisville reintroduce them into the region of the patient’s heart that had been scarred by a heart attack. The purified batch of cardiac stem cells was infused into the patients’ hearts approximately 4 months after their bypass surgery, allowing time for the bypass surgery to heal. Amazing Results: Heart Damage Reversed! The results were beyond their wildest expectations. Ejection fraction increased and the amount of scarring and damaged cells decreased. Heart damage was reversed without dangerous side effects. At the start of the study Dr. Bolli’s patients had an average ejection fraction of 30.3%. Four months after receiving stem cells, their ejection fraction was 38.5%. Some patients followed for a full year improved to an an astounding 42.5%. A control group given nothing but standard maintenance medications showed no improvement at all. Dr. Anversa found that the heart contains a type of stem cell that can develop into either heart muscle or blood vessel components—whatever the heart needs depending on its injury. But there usually aren’t enough of these heart stem cells available after a heart attack. To provide a patient more of these heart stem cells, the doctors removed heart stem cells by a biopsy and then made millions of copies in a laboratory. Drs. Bolli and Anversa and Dr. Marban both used cardiac stem cells, but Drs. Bolli and Anversa “purified” the cardiac stem cells so that more than 90% of the infusion was actual stem cells. Dr. Marban, on the other hand, used a mixture of stem cells and other types of cells extracted from the patient’s heart. “We found that the mixture is more potent than any subtype we’ve been able to isolate,” he says. The additional cells may help by providing a supportive environment for the stem cells to multiply. Other scientists have produced improvements in cardiac patients using stem cells derived from bone marrow, though the results aren’t as spectacular as the above studies. Dr. Bolli’s study (called “SCIPIO’) was the first reported human study of heart derived stem cells. Patients who received these stem cells had significant improvements in heart function, physical capacity and scored better on quality-of-life questionnaires. MRI and ultrasound imaging revealed that areas where stem cells were infused showed major improvement which continued over a year. 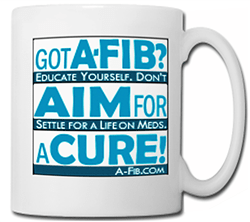 Though this study was not directed to A-Fib patients, let’s fantasize a bit. This study shows that heart stem cells can replace scar tissue and fibrosis with normal beating heart muscle fibers, thereby restoring heart function. Fibrosis and scarring, which are normally considered irreversible heart damage, may no longer be permanent. 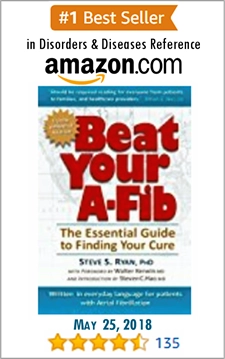 Though the jury is still out on this, some studies indicate that fibrosis is associated with A-Fib. 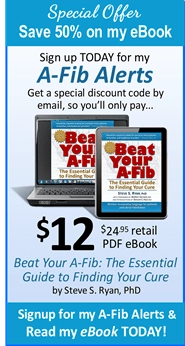 (see 2013 BAFS: A-Fib Produces Fibrosis—Experimental and Real-World Data). 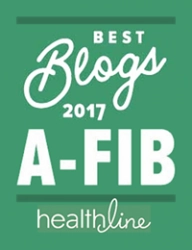 And fibrosis is linked to the threat of an A-Fib stroke (see BAFS 2014:High Fibrosis at Greater Risk of Stroke and Precludes Catheter Ablation: Lessons Learned from the DECAAF Trial). if injected stem cells somehow signal the heart to repair itself, this may turn fibrosis and scarring back into normal heart muscle. 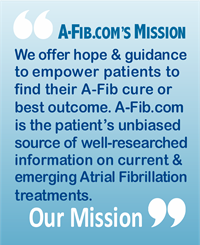 In the near future a patient with A-Fib, instead of having to undergo catheter ablation (or surgery), may instead receive an injection of their own heart stem cells and be cured of A-Fib and the threat of an A-Fib stroke. The only risk would be getting a biopsy inside the heart to get a sampling of heart tissue stem cells, then months later another procedure to insert the purified and multiplied heart stem cells. Though not simple procedures, they would probably involve less or at least an equal amount of risk as a catheter ablation but with no permanent scarring through ablation. Right now the costs of standard (non-heart) stem cell injection is around $4,000-$5,000 per injection. But currently very few doctors around the US do it. The author predicts that heart stem cells injection will rapidly become a standard treatment option, even for A-Fib patients. There shouldn’t be any political or religious objections to this heart stem cell therapy, since it doesn’t rely on embryonic stem cells. Cardiac stem cell injection is probably a major medical breakthrough for A-Fib patients. Heart stem cell injection regenerates heart muscle. In Dr. Bolli’s words, “if a phase 3 study confirm this, it would be the biggest advance in cardiology in my lifetime. We would possibly be curing heart failure. It would be a revolution.” And this revolution will probably work in patients with A-Fib. • O’Riordan, Michael. “Cardiac stem cells improve LV function, reduce infarct size in ischemic cardiomyopathy.” HeartWire November 22, 2011.